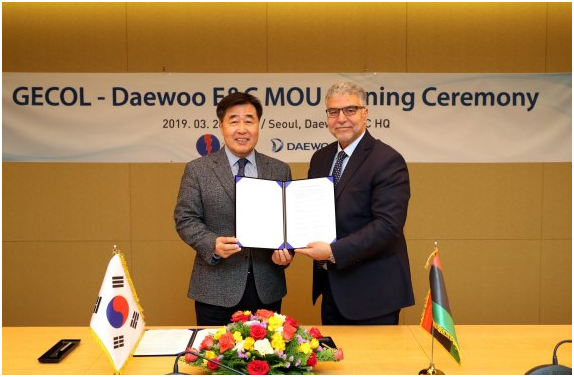 South Korean Daewoo Engineering & Construction (E&C) Co. announced on March 21 that it had signed a memorandum of understanding (MOU) on the construction of a 450 MW power generation facility at Western Mountain Combined Cycle Power Plant with General Electricity Co. of Libya (GECOL) at its headquarters on March 20. Western Mountain Combined Cycle Power Plant is located in Al Hawamind, 200 kilometers southwest of Tripoli, the capital of Libya. The power plant will have a total power generation capacity of 900 MW after the completion of the project. Daewoo E&C will undertake the expansion project to ramp up the power plant’s power generation capacity by 450 MW by installing a heat exchanger and a steam turbine to recover waste heat from the power plant. “GECOL is keen to promote the project and we will discuss conducting a survey in Libya and a detailed procedure to finally seal the deal,” Daewoo E&C said. To top it off, on March 19, the Korean builder concluded a contract to resume the construction of Zwitina Power Plant which had been put on hold since 2014 due to a civil war in Libya. Zwitina Power Plant was recording 72 percent progress at the time of construction suspension in 2014. Daewoo E&C agreed with GECOL to prepare for construction work and resume construction in the future .